Today’s standard reference for eldercare resources in San Diego County was first conceived and published in the 1990s by ReVisions Resources. At that time, eldercare organizations in San Diego were already abundant. However, despite a critical need among the aging population, only a tiny handful of aging network professionals were aware of the available options. Worse, information geared to consumers was nearly nonexistent. As adult caregivers who were frustrated with trying to find and evaluate help for their loved ones, the founders of ReVisions Resources developed the San Diego Eldercare Directory. The result was a comprehensive community resource for caregivers and seniors. It provided quick access to critical information, such as which issues families need to consider, who to call, and the questions to ask. The San Diego eldercare Directory was organized into 14 topics, each introduced by an article featuring tips, checklists, answers to commonly asked questions, and questions to ask service providers. These topics included in-home care, financial and legal matters, insurance, nutrition, adult day care, housing options, and caregiving information and support. Supplementing this core of information were the yellow-page-like listings of more than 1500 local resources to help seniors live independently, to stay in their homes, and to find long-term care. These services directly responded to what caregivers still view as their most critical need: time for themselves. 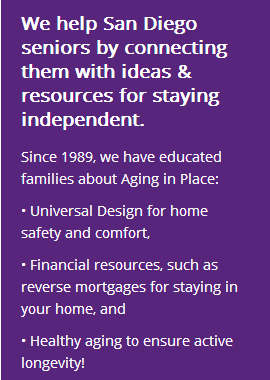 Listings in the San Diego Eldercare Directory included resources for respite care, adult day care, in-home care, meals, transportation, housing, and home security. Also spotlighted were new (at the time) service programs, such as wound care, personal chefs, and moving assistance. Providers listed ranged from government agencies to nonprofit healthcare agencies to community service organizations to for-profit businesses. The first edition of the San Diego Eldercare Directory, a labor of love and countless volunteer hours, was published in October 1996. The 10,000 copies were in hot demand by family and professional caregivers. Requests for the book came from a broad range of people, including corporate CEOs, disabled homebound adult children, ministers, hospital discharge planners, social workers, property managers for senior housing, attorneys, financial planners, and public service agencies. Ongoing excitement for the publication demonstrated that the San Diego Eldercare Directory was filling an important need in San Diego County. libraries throughout San Diego County. Funding for the directory was provided through corporate and foundation support, advertising, and volunteer contributions. Community sponsorship was provided by SDG&E and the SDG&E Employees’ Contrib Club. Other sponsors included Alliance Healthcare Foundation, Hunter Industries, Lutheran Brotherhood, Rice-Church Financial, San Diego State University/Center on Aging, Senior Citizens Board of Consultants, Union Bank of California, and West, Turnquist & Schmitt. In 2000, ReVisions Resources sold the San Diego Eldercare Directory to the San Diego Union Tribune Publishing Company. It is still being published annually and remains an important community resource. "The book is the comprehensive community resource for caregivers." "The book is very valuable in sorting out what is and what is not available... at a time when you don't need any more difficulty in your life." "Thank you so much for the San Diego Eldercare Directory. You've saved me valuable time and energy." "On behalf of the 60 families who must move their parents from [a now-closed nursing home], thank you. Your book has been a lifesaver. We don't know what we would have done without it."